Target organ and PPE chemical hazard labels clearly identify hazardous chemicals in the facility ensuring worker safety. 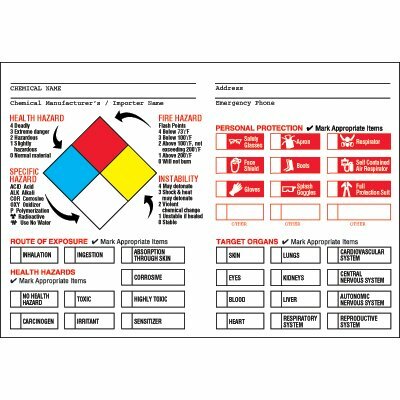 Features the NFPA diamond for easy hazard identification. Choose either the Paper material for labeling temporary storage containers or Vinyl for long-lasting adhesion and durability. Designed with self-adhesive backing for easy peel-and-press application on any clean, smooth surface.